Here’s a combination of color you don’t often see in gardens or arrangements…crimson and coral, beautiful in the morning sunlight. 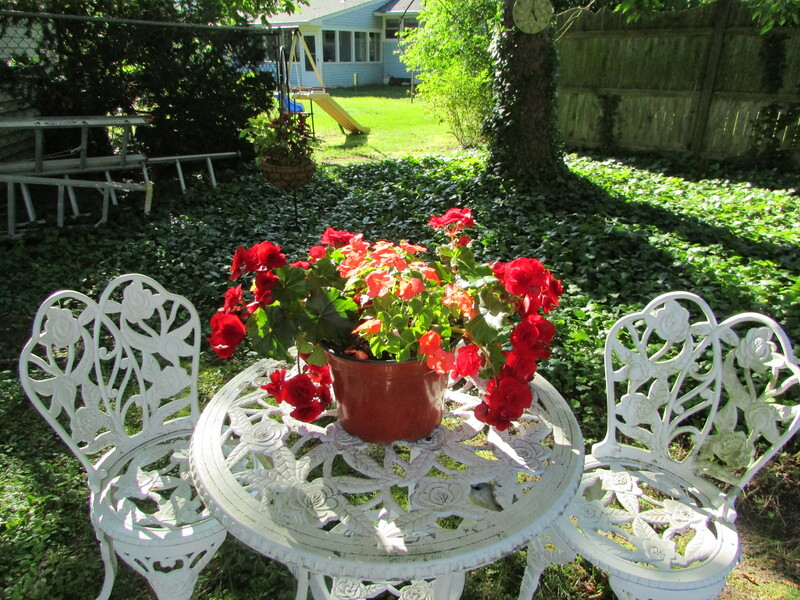 The flowers in the photo are Tuberous Begonias and Impatiens. Thank you Mary, I love the color combination. Very pretty! Definitely something I will consider for a planter — crimson and coral, how cheerful! Reminds me of a song that is way before your time…Crimson and Clover…every time I try to write crimson and coral, clover wants to pop out instead. Oh my…what a dinosaur I am…not sure I’ve heard that one…still stuck in another decade. Funny. Now that song will be stuck in your head all day…I still think of your quest for the ‘scent of lavender’ books. I just know I will think of it one day. It is a beautiful combo – and my aunt was just here with coral polish on her toe nails and it was so pretty! Anyhow – I also like the white furniture – holds the red and coral in such a nice way! It looks like a perfect English garden- I love red and particularly that shade. What a contrast with the white. Beautiful house and grounds, if I may say so, Kathy. Thank you Susie, but then I must confess, I take pictures of the pretty spots, and leave the not so pretty spots out of the picture. If only life was a pretty as a photo all the time. What a deep thought but a nice perspective I think. We need to leave out the bad and ugly and focus on the good in our lives. Nice food for thought. Thank you, Kathy.